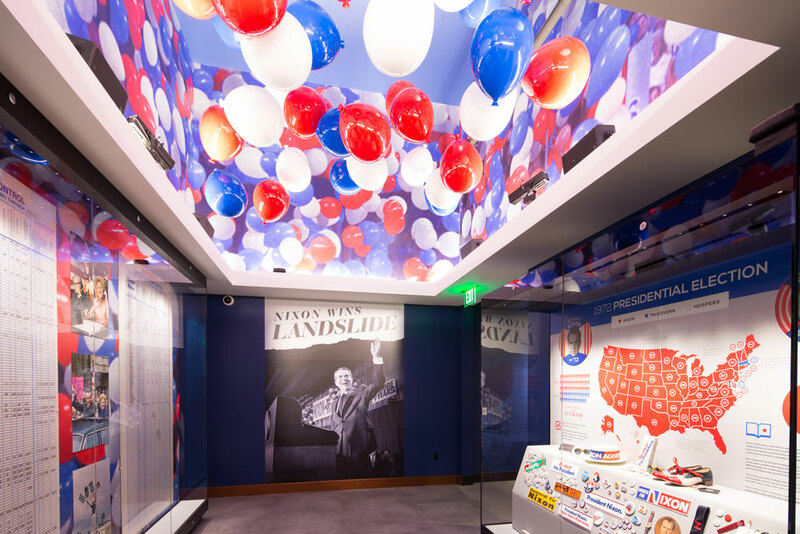 Plan your visit to the New Nixon Library and Museum — a modern presidential museum complete with updated technology, interactive displays and participatory learning opportunities. 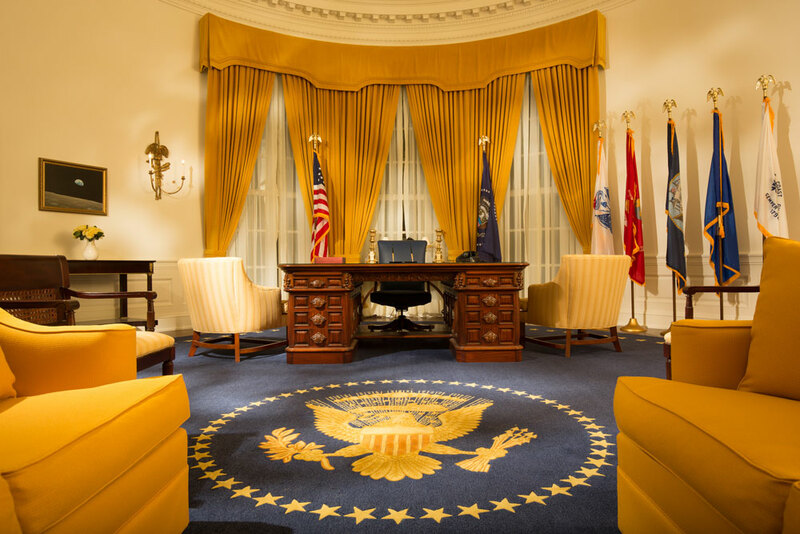 The Richard Nixon Presidential Library and Museum features nearly 70 new exhibits, a replica of President Nixon’s Oval Office, the spectacular First Lady’s Garden, the President’s faithfully restored 1910’s birthplace, a replica of the White House East Room and the flower-ringed memorial sites of President and Mrs. Nixon. 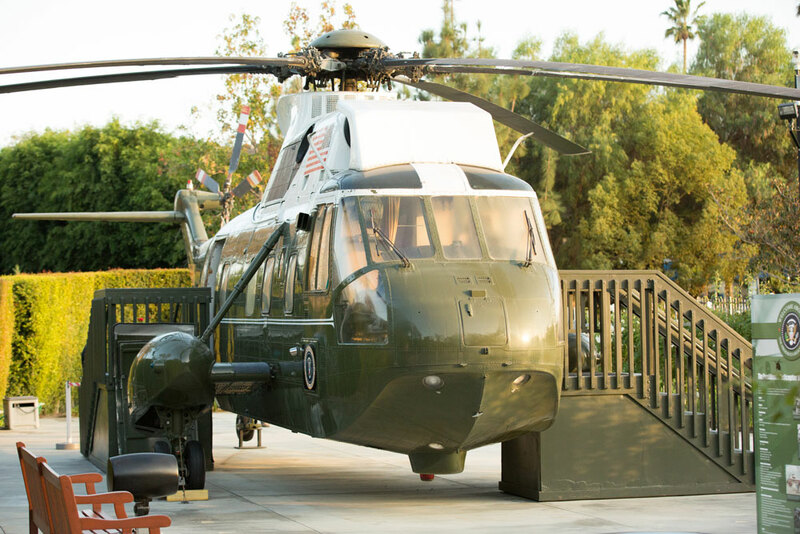 Because of the limited access, admission to the Nixon Library will be half the price of regular admission. The Marlene and Fred Malek Theater – Guests begin their tour of the new museum by viewing an originally produced multi-media presentation that introduces Richard Nixon and his 50-year career in public service. The Wave of Change – Vivid super-graphics stretch along walls as a barrage of sights and sounds brings to life some of the landmark events, people, and images of the years immediately preceding Richard Nixon’s election to the presidency. At the end of the hall, Richard Nixon is elected 37th President of the United States. 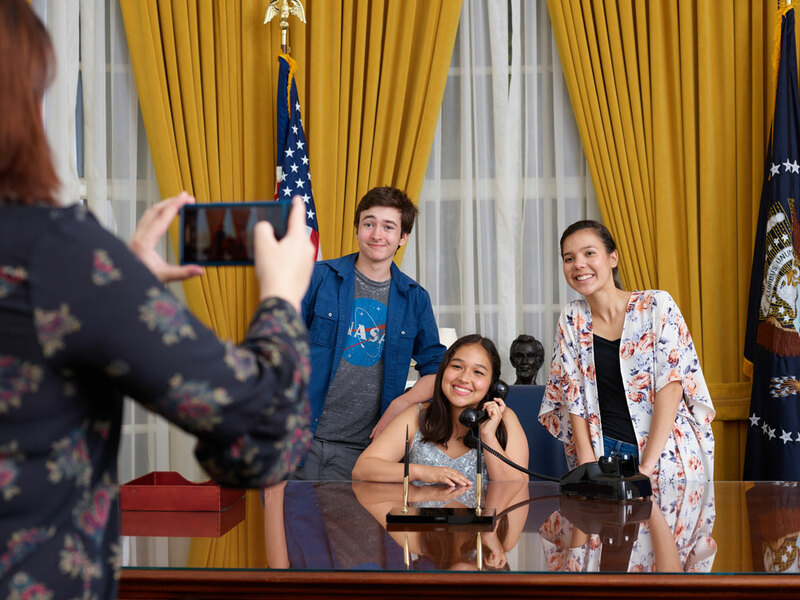 The Ambassador and Mrs. George L. Argyros Oval Office – An exact replica of President Nixon’s Oval Office offers guests an immersive exploration of the most famous office in the world, including an opportunity to take a photo behind the president’s desk. 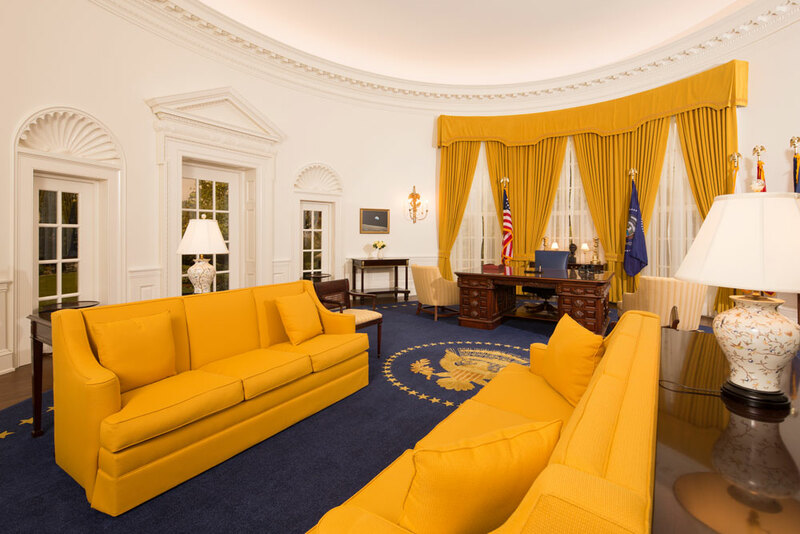 The office is designed in the original 1969 decor of California blue and gold, which was hand-selected by First Lady Pat Nixon. 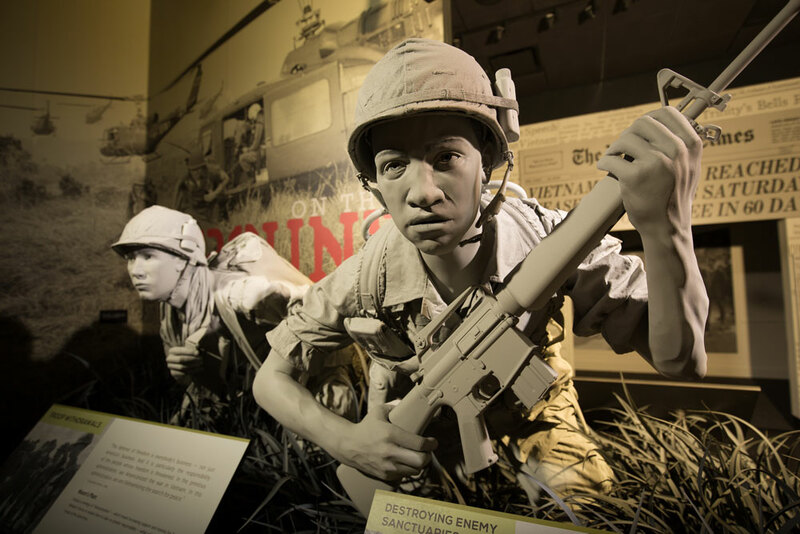 The Vietnam War – Guests are confronted with the situation in Vietnam, just as President Nixon was on January 20, 1969. Explore the contentious national conversation surrounding the Vietnam War and President Nixon’s actions and decisions. 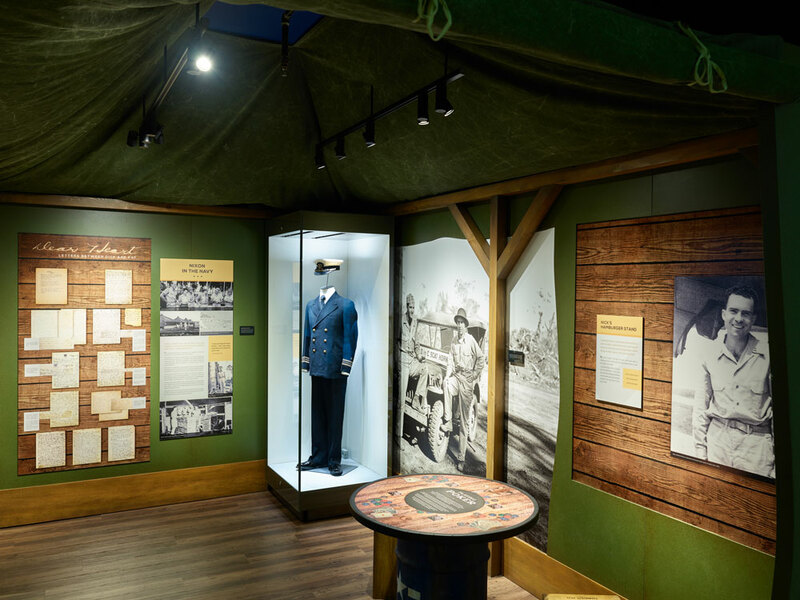 Artifacts and vivid images highlight the stories of the POWs as well as their celebrated homecomings. Domestic Policy Vision – Discover the key ideas of Nixon’s overall domestic policy. Communism and the Cold War – A Soviet missile replica provides a backdrop for this exhibit that explores the broader global issues of communism and the Cold War and their role in shaping President Nixon’s policy of détente. A large piece from the Berlin Wall highlights this iconic symbol of the split between the Communist and non-Communist worlds. Pat Nixon – Guests will step into a space that explores Pat Nixon as an influential First Lady and America’s Ambassador of Goodwill. From her world travels to domestic initiatives, Pat Nixon shaped the ongoing progression of the role of the First Lady as an active, welcoming, and vital presence in the White House and throughout the world. The Week That Changed the World – Stepping through an iconic moon gate portal, guests relive the historic handshake between Richard Nixon and Chinese Premier Zhou Enlai during the 1972 trip to the People’s Republic of China. 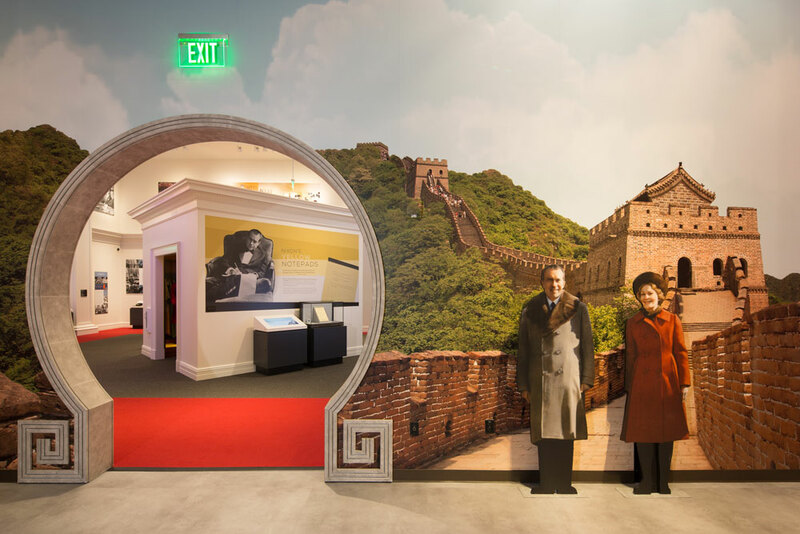 Images, text, and artifacts explore the relationship between the U.S. and China, Nixon’s China initiative, the diplomacy that culminated in the trip, the events of the Nixons’ time in China, and the legacy of the “week that changed the world.” Guests will be able to pose for a photo on the Great Wall of China with President and Mrs. Nixon. 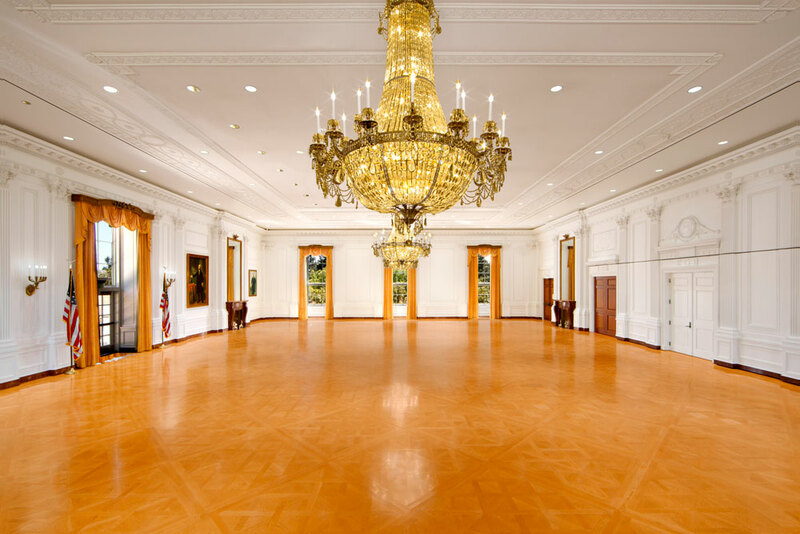 Life in the White House – An elegant space designed like a room in the White House highlights the First Family’s daily lives. 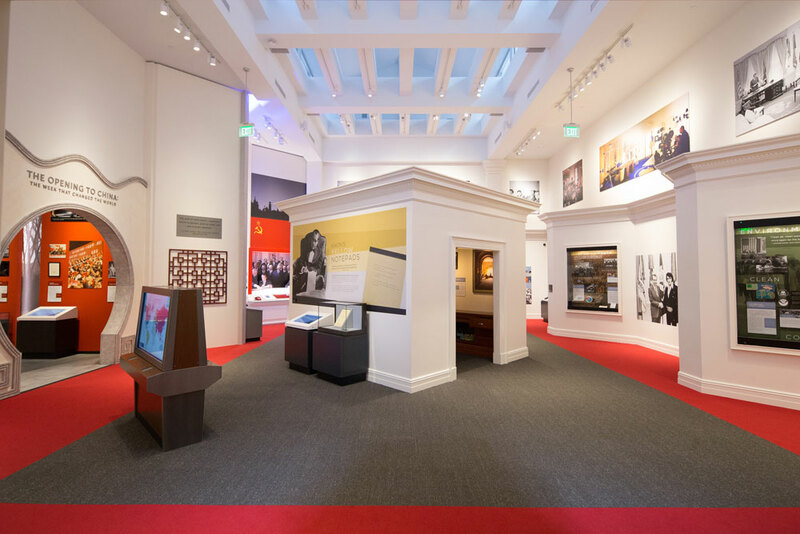 An interactive experience invites guests to explore some of the events and entertaining that occurred in the Nixon White House, as well information on the Nixon family. 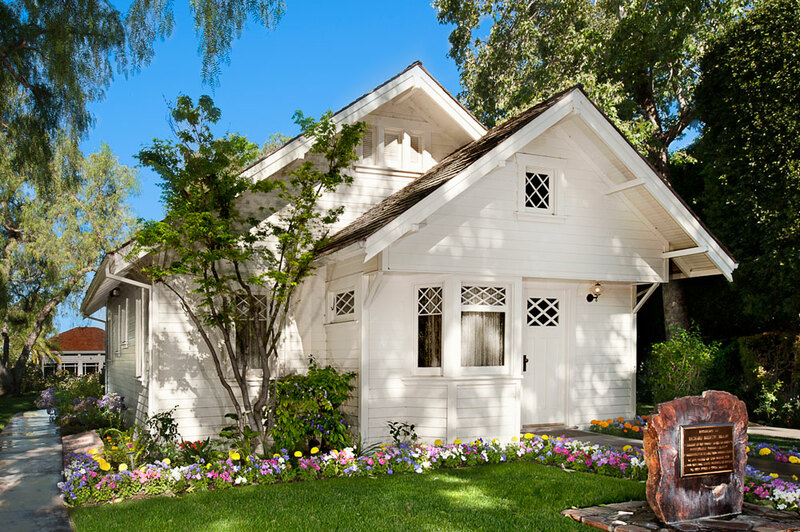 The Western White House – A re-creation of President Nixon’s study at La Casa Pacifica immerses guests in the life of the working Western White House in San Clemente. 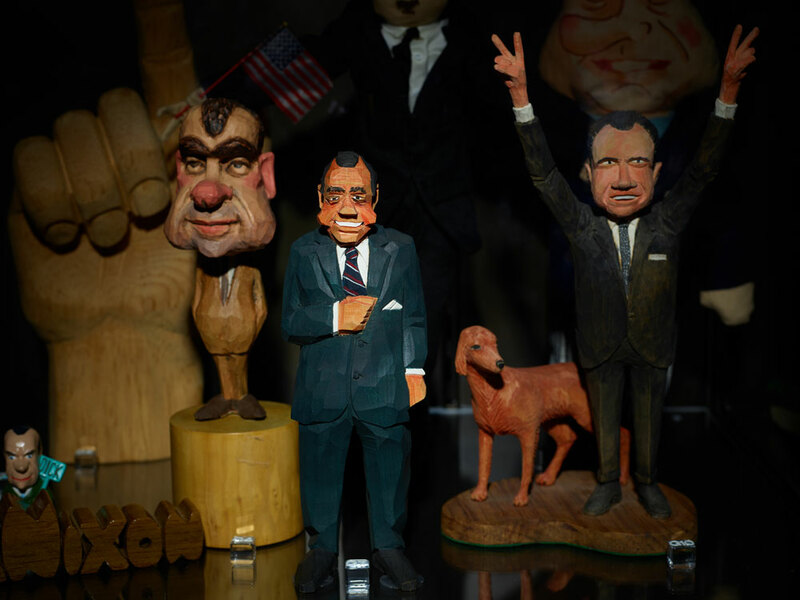 The Middle East – Guests can explore images and artifacts highlighting Nixon’s goals and achievements in the Middle East – most notably in regard to the Yom Kippur War – as well as how his policies in the region remain relevant today. Statues of Egyptian President Anwar Sadat and Israeli Prime Minister Golda Meir from the Library’s existing exhibits are displayed here. Tough Choices – At this interactive station, guests play the role of an unnamed advisor to President Nixon. By consulting actual advisors and examining a multitude of official memos, reports, and news media, visitors advise President Nixon on a course of action for three important decisions — bombing Cambodia, aiding Israel during the Yom Kippur War and implementing an all-volunteer military. 1972 Campaign & Victory – Nixon’s landslide victory in the 1972 campaign provides a portal into the next gallery. A captured moment in time, scenic balloons hang frozen mid-fall above the path, and directly ahead guests hear words from Nixon’s second inaugural address. Watergate – The exhibit explores the personalities, actions and intentions at the heart of the Watergate scandal, chronicles the events beginning in June 1971, with the leak of the Pentagon Papers and ending with President Nixon’s public explanations of Watergate after he left office. The content of the Watergate exhibit that opened at the Nixon Library in 2011 remains. Farewell Speech and Departure – Guests step inside Army One on August 9, 1974, where they find the President and Mrs. Nixon sitting aboard. 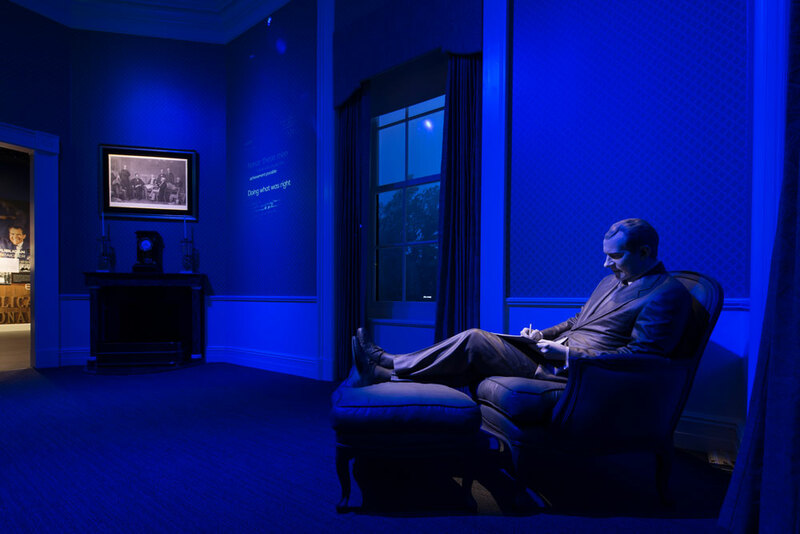 Footage in the windows and an audioscape immerse guests in the Nixons’ departure from the White House and transitions guests back to Nixon’s beginnings. Back to the Beginning and Early Years – Looking through the windows offers guests a serene view of the humble farmhouse where Richard Nixon was born and spent his earliest years. 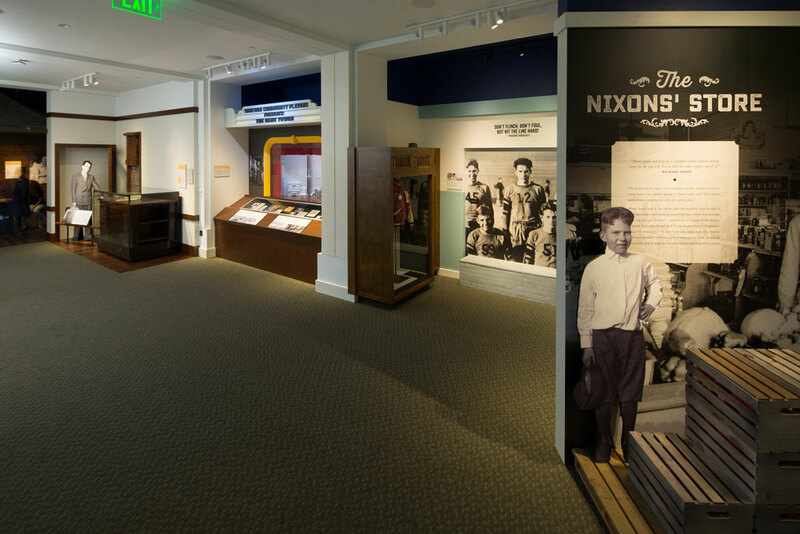 A gallery of displays and photos tells the story of Nixon’s family and childhood, his meeting Pat Nixon and service in World War II. 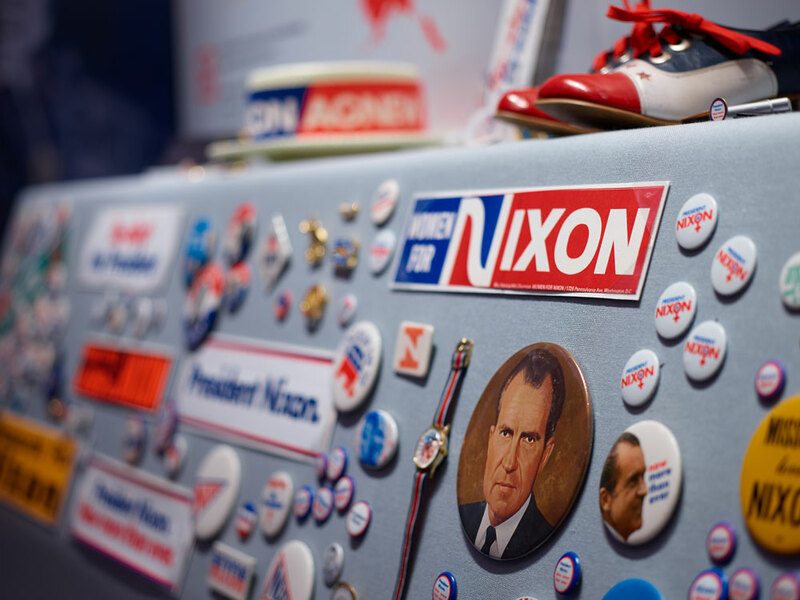 Man in the Arena – As guests leave behind Nixon’s early years, they step into a dynamic series of galleries capturing some of the peak moments of the future president’s ambitious political career, including his time in Congress, the Fund Crisis of 1952, and the Vice Presidency. 1960 Campaign and Wilderness Years – Guests find themselves on a re-creation of the set for the Nixon/Kennedy debates. An old-fashioned television camera hulks in its place. Following the loss to JFK, many wrote-off Nixon’s future political aspirations. Guests will see how Nixon made his remarkable comeback in the late 60’s. 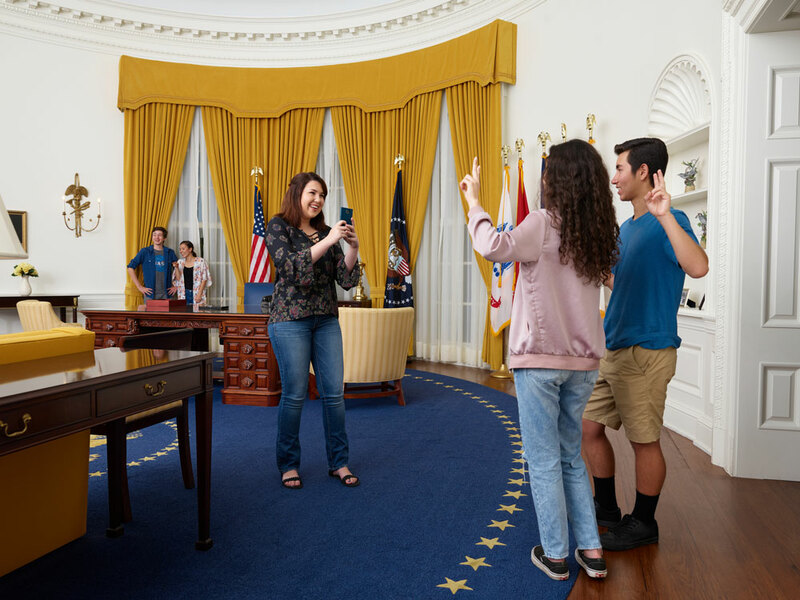 The Esther and James Cavanaugh Lincoln Sitting Room – Guests step out of the triumph of 1968 and into a replica of President Nixon’s favorite room in the White House. 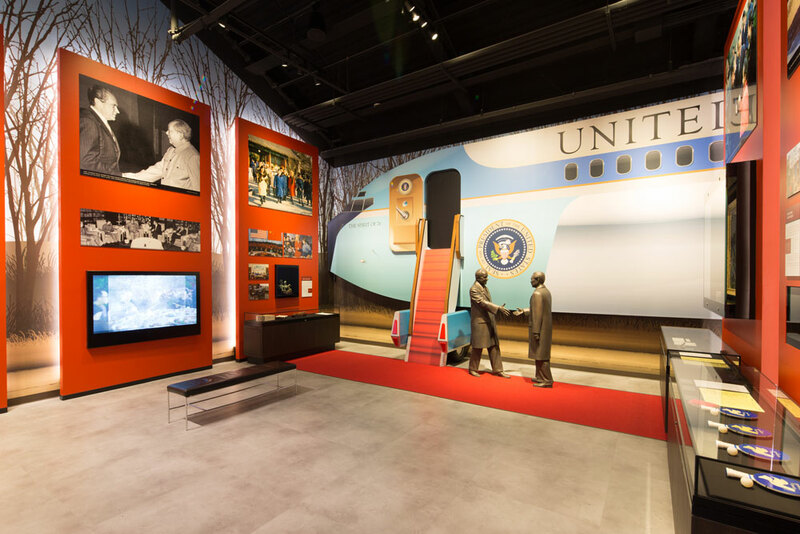 This multimedia experience delivers the sites and sounds of the important events of the Nixon presidency accompanied by commentary from the President. The Eagle’s Nest – In a realistic re-creation of Nixon’s New Jersey study, guests begin their exploration of Nixon’s work as an elder statesman and advisory to his successors in his post-presidency. Nixon in Popular Culture – From books to film, television, drama, opera, and more, Richard Nixon left a lasting mark on American culture. 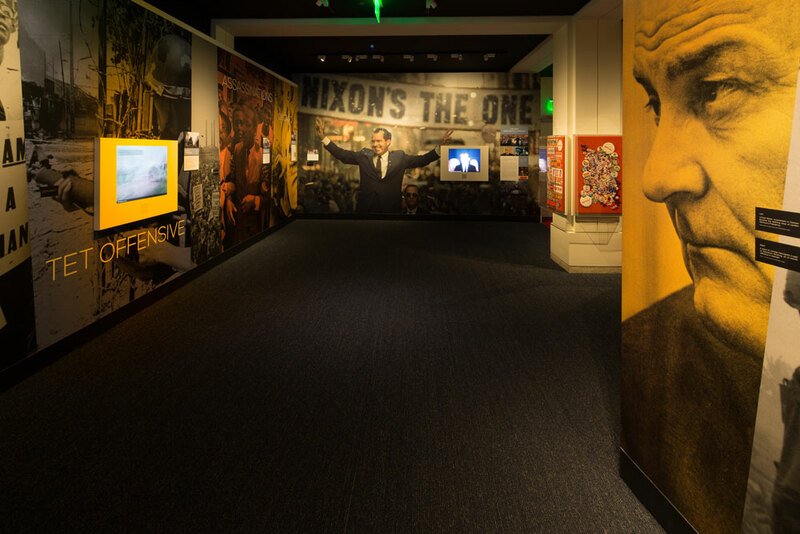 Guests can explore both Nixon’s own contributions through his 10 books and others’ interpretations of the man and his legacy in popular culture. 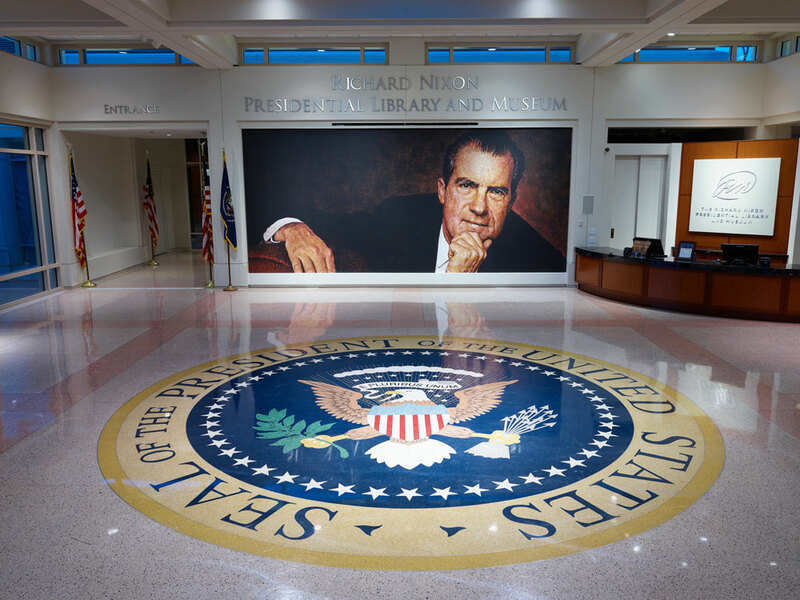 Saying Goodbye – A moving passageway offers displays on the deaths and funerals of Pat and Richard Nixon including video excerpts. 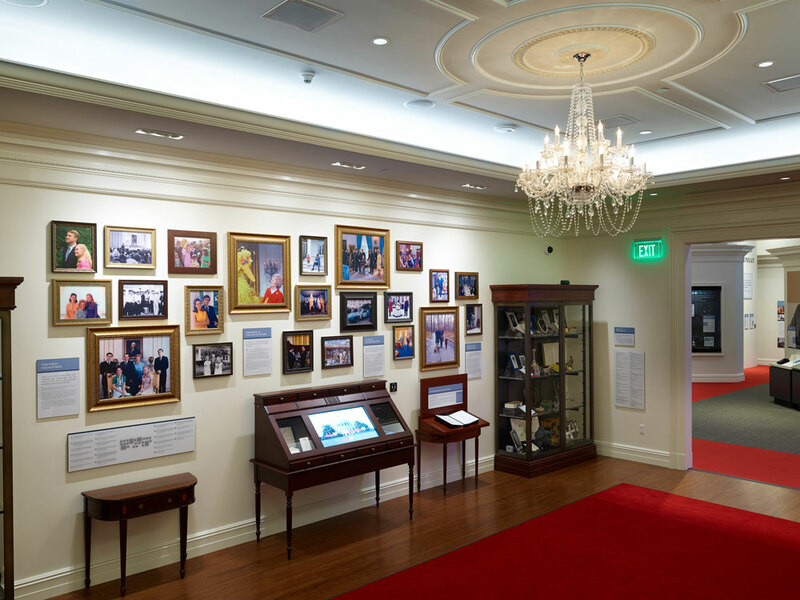 President Nixon’s own voice provides sparing words of inspiration to send guests onward.